On Gaudete, "rosaceus," Sunday, Raymond Leo Cardinal Burke sung Pontifical High Mass at the Church of All Saints (FSSP) in Minneapolis, Minnesota (USA). Present in choir were both the Archbishop of the Archdiocese of Saint Paul and Minneapolis as well as his auxiliary, Bishop Andrew Cozzens. Cardinal Burke carried the white oak crosier of Bishop Cozzens (see photo), which was created in 2013 just before the Bishop-elect's episcopal consecration. The crosier, a unique work of art in the style of the neo-Gothic revival, is the work of professional woodcarver Paul Sirba, a Minnesota native based in the Twin Cities. It took Paul 3 weeks and 80 hours to carve the piece, making use of 150 woodcarving tools. The motto of Bishop Cozzens is seen in the crook under the arms: “Praebe Nobis Cor Tuum” (Lend us your heart). Paul receives his inspiration from two uncles who are priests (one is a bishop). He apprenticed under a classic Greek Orthodox master woodcarver in Minneapolis. During a pilgrimage to Italy in his youth, Paul was captivated by the architecture and seeks his inspiration from it. 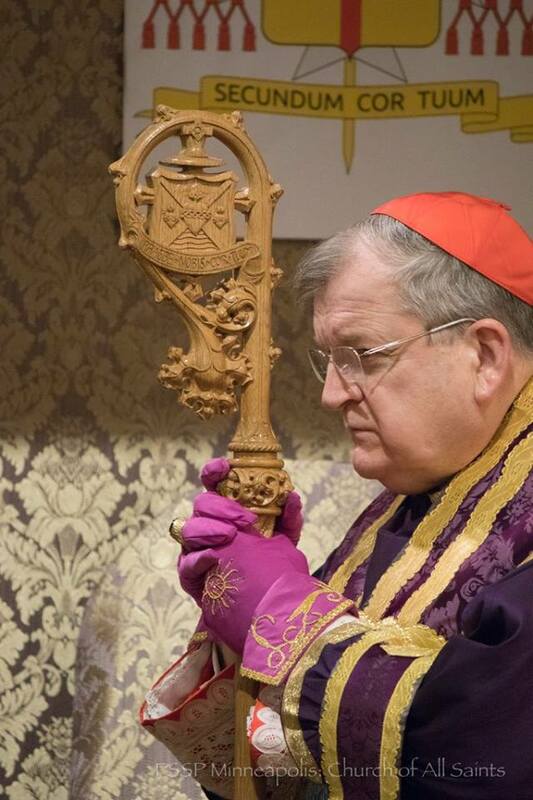 Of all the beautiful sacramentals and objects that stand out in Pontifical Mass, the crosier carries heavy symbolism, reminding the faithful of the bishop's solicitude for the sheep under his care. Bishops are pastors of souls, who exercise their episcopal office as shepherds of their flocks, in communion with and under the authority of the Supreme Pontiff. Congratulations, Paul, on this beautiful work of art and keep up the very fine work.